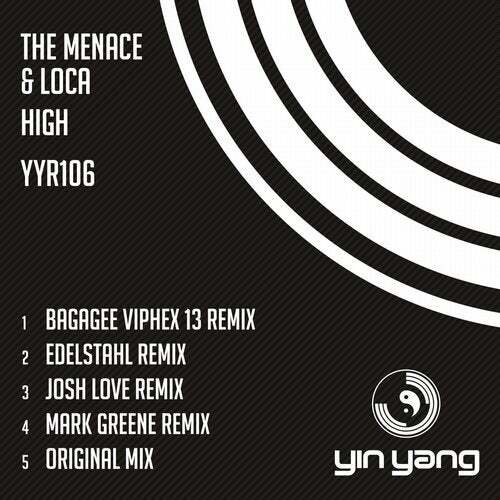 Scotlands super duo The Menace and LOCA team up once again, this time for High. The original is a dirty little monster that growls and spits at you, like a naughty little boy, that's grown up 'wild' in the amazon rain forest. Its a beast of track thats laced with vocal snippets and stabs that propel the track forward and have you reaching for the sky with a big smile on your face. Its a bomb and thats for sure. Super amazing original. Remixes comes from the Yin yang elite on this one. First up is Koreas Baggage Viphex 13. Wow. Now this is a super remix, still has all the original elements in it, but still keeps to its own style. Very much more on the progressive techno tip. This is superb remix. Awesome. Next is The Mexican living in Switzerland. Edelstahl always makes me dance. This is a superb tougher remix that will have you thrusting your hands in the air. Tough techno and an amazing remix. Magnifico. Frances Josh Love is next.. and again WOW. This guy is really delivering the goods lately.. Check out the dirt and with whist still bing clean. Another tougher interoperation that will surely be caned. Superb. Mark Greene makes his debut on Yin Yang here and again, I have to say it. Wow. This is an incredible hard techno version of the original, again keep true to the original and making his own. Gobsmacked.